World class squash returns to New York this month for the first PSA Platinum tour event of 2019. The JP Morgan Tournament of Champions will be played between January 16-24 with the action shown live on SquashTV. 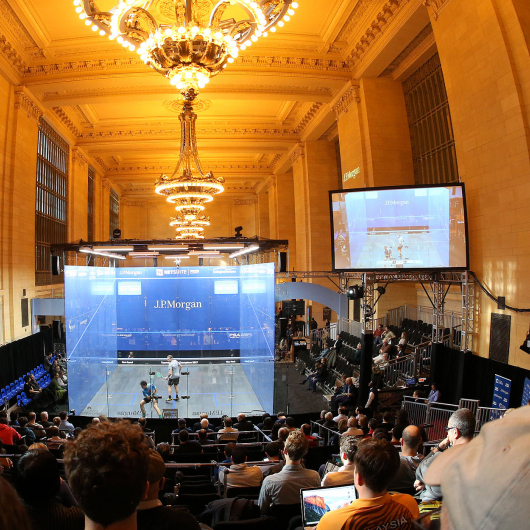 The tournament will see the best players in the world, including our Karakal stars, compete for the men’s and women’s PSA Platinum titles at the iconic New York’s Grand Central Terminal venue. In the first round Cameron Pilley will be playing Nathan Lake from England, Greg Lobban faces off against Mexico's Arturo Salazar, Chris Simpson will meet Spain's Borja Golan, whilst Zahed Salem and Karim Ali Fathi will play a Karakal head-to-head. In the women's event, 8th seed Tesni Evans is in the bottom half of the draw and will received a first round bye, so won’t be playing until Sunday.